No airline miles are useless. Airline miles, next to SPG points, are a very valuable currency even though they are being devalued daily. You should set a notification in your calendar to alert you to check your frequent flyer miles every year. If you have not done so, check your old frequent flyer programs and look for a great deal. I just found one on American Airlines which also allows you to book one way trips unlike other airlines. 1. Use your miles to redeem for a magazine subscription – which I’ve been doing for the past several years. 2. Tie your frequent flyer account to the Rewards Network mileage dining program. Here’s the link. My friends and I decided to sign up for the Paris Marathon occurring in April 2015. And more recently, I got the expiring American Airlines miles e-mail notice. I only had 20,000 so odd miles from 5 or 6 years ago that I never touched and almost forgot about. Little did I expect I could purchase a San Francisco (SFO) to Paris (either airport) flight for 20K miles one-way. With all the devaluation going on at airlines, this was a pleasant surprise. I booked an USAirways flight (AA partner) for 20k with one stop in Charlotte and minimal fees. Note that British Airways (another OneWorld partner) requires you to pay an excessive stopover in London for $300+. If your USAir miles somehow expired, refer to our previous post to get re-activated. I have been flying in and out of SFO for several months but have not had to switch flights from the domestic terminals to the International Terminal. There used to be a bus located at the lower level near Gate 72 that takes you from SFO Terminal 3 to the International terminal. That bus is no longer available. SFO has completed a connection bridge that takes you from Terminal 3 to the International Terminal. You will need to walk from the gates of Terminal 3 to the SFO International Terminal via this bridge. 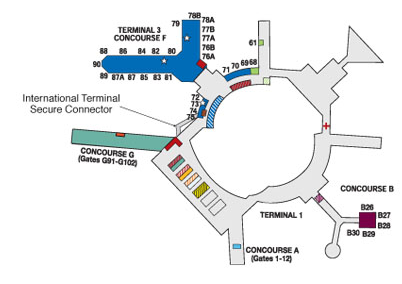 The walk way connecting SFO’s Terminal 3 and the International Terminal is near Gate 75 (shown in the map below). It would have been great if travelers received information information about the new bridge at SFO. 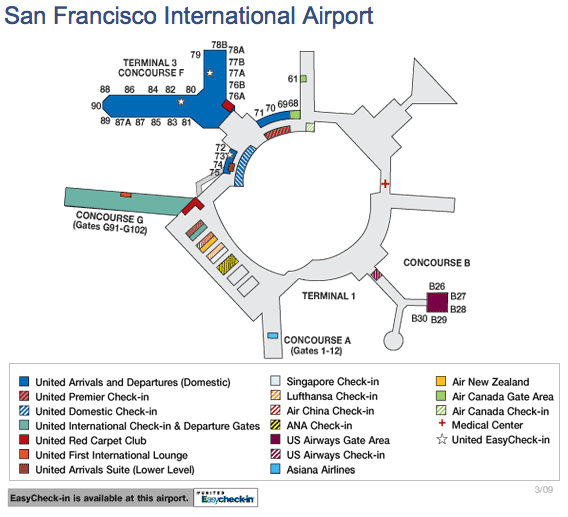 You can also view my other posts on: How to a quickly check into SFO Terminal 3 and a recently updated post on the time and schedule of when the gates are opened.